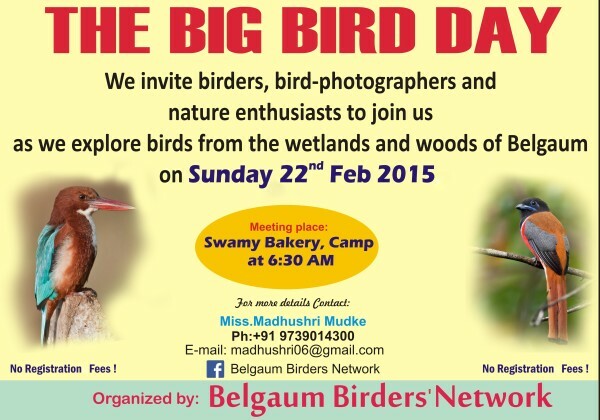 The Belgaum birders’ network is a group of enthusiastic bird watchers and photographers documenting birds all around Belagavi. The members plan this to popularize this brilliant hobby and also to encourage people of all ages and genders to come together and contribute towards conservation of fauna and other wildlife. Documentation of birds at a particular location helps create awareness about many unknown and unrecognized species thus stressing over better measures for habitat protection. Everyone should work towards forest and wildlife conservation. Belgaum is blessed with rich flora and fauna as we are placed in the core of western ghats. But unfortunately people here have taken it for granted & not much aware of it. Activities towards nature awareness & its conservation is the need of the hr @ Belgaum. Good to know we have some initiative happening in this line. Request all amateur conservationists to contribute to this initiative & make it a success.